Continuing on the success of Pandemic: Iberia over New Years with my wife, we next tried the balance game Babel. 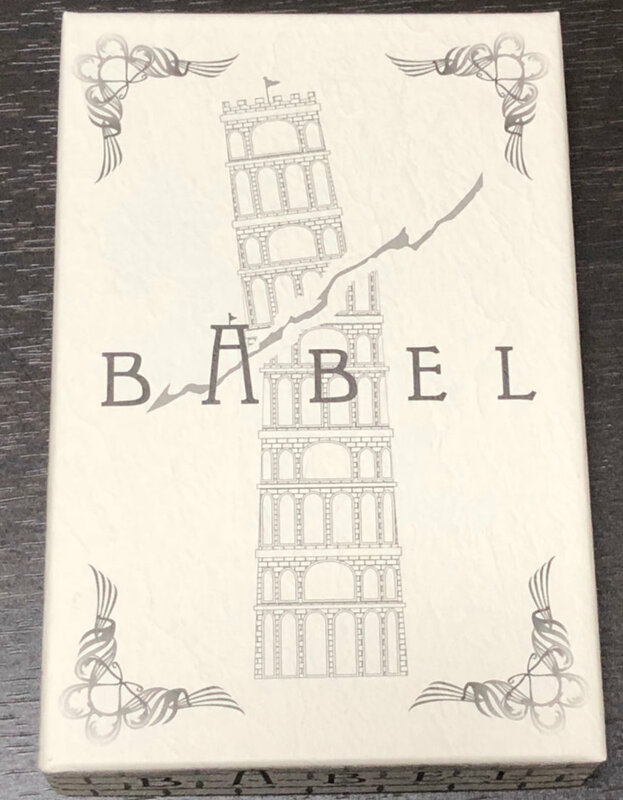 Babel comes in a sturdy box with a nice pulp texture to it. It can be played with 1 to 5 players and takes 15-30 minutes. The version we played was the new version that came out in 2017. The previous version came out in 2016 and had some differences with the components. In the box are 36 wall cards, 45 blue print cards, 10 base cards, one ceiling card, and 5 language cards, plus the instruction booklet. The components are well-made and sturdy. Appropriate to its biblical namesake, Hebrew is used as a design element on the cards. 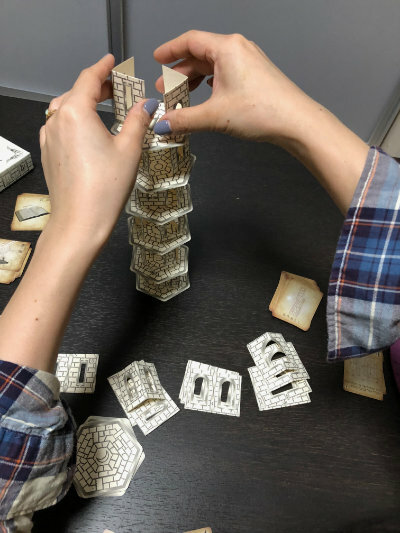 The goal of the game is to build an eight floor tower of Babel, but there are three ways the game can be played. The first is with hidden roles; the second is a purely cooperative game; and the third is a “Capricious God” mode. All of these work off of a core set of rules, so we’ll start with them. 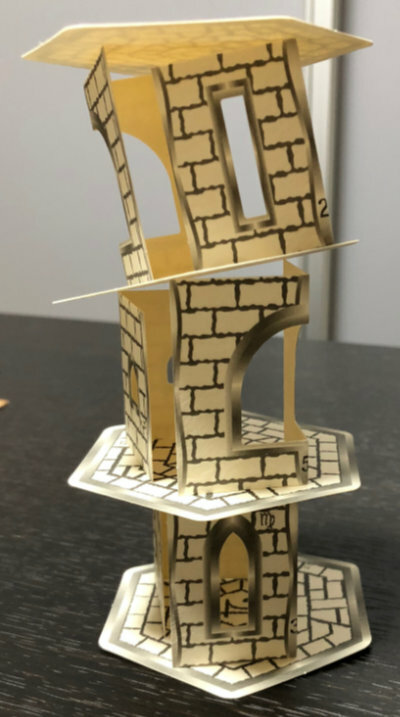 The wall cards come in five different heights. Blueprint cards are also numbered one to five and indicate the height of the wall to be used. On a player’s turn, they select a Blueprint card and show it to everyone. The other players then each place one Blueprint card facedown and the player whose turn it is selects one. 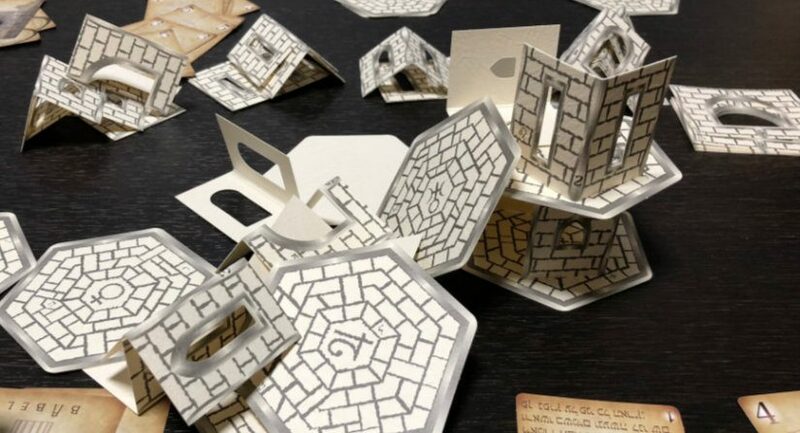 They then take two wall cards whose heights correspond to the selected Blueprint cards and build a new floor of the tower. Players can comment on their cards, but they can’t explicitly say the height of the card they played. Mixed in with the Blueprint cards are two types of special cards: Thunderbolt and Destruction. When a Thunderbolt card is played, the topmost level of the tower is removed, causing the height to decrease by one. When a Destruction card is played, the player whose turn it builds the floor with only one wall card instead of two. 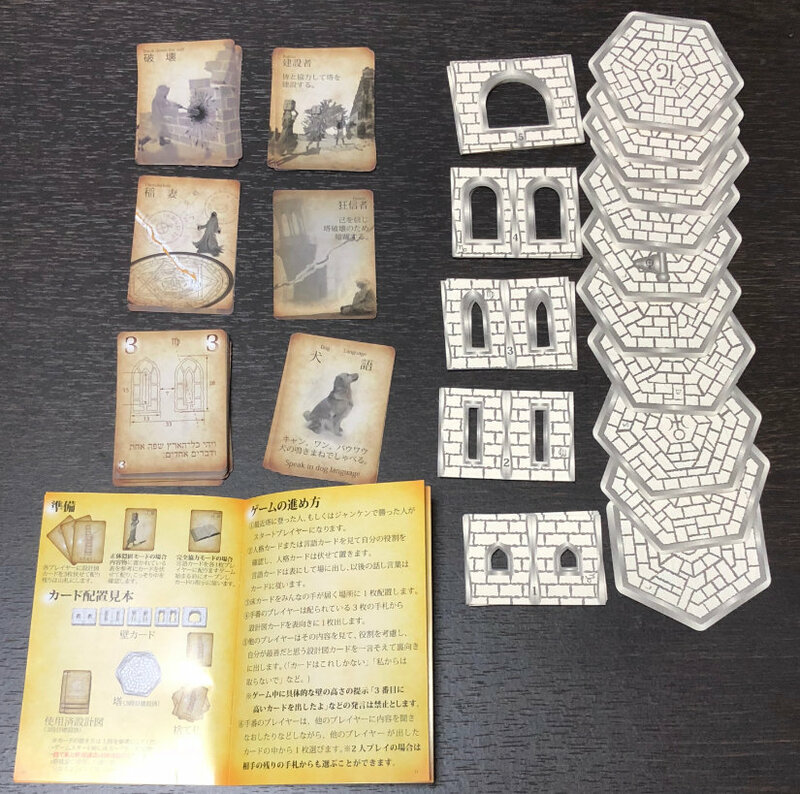 In this mode, there is always at least one Fanatic (determined secretly by dealing role cards) that is trying to sabotage the construction of the tower. They can’t directly knock over the tower because that counts as a win for the Builders. Instead, the winner depends on who caused the tower to fall– if a Builder collapsed it, then the Fanatics win. If a Fanatic collapsed it, then the Builders win. On their turn, a Fanatic may reveal themselves by saying, “Babel!” This increases the number of required floors by one, but the Fanatic then plays the rest of the game with an open hand. This mode is played without Fanatics so that all players are Builders. Cards from other players are still played facedown, so it’s possible to get a bad combination of cards. To add some fun to cooperative play, there are five language cards that can be dealt to players. 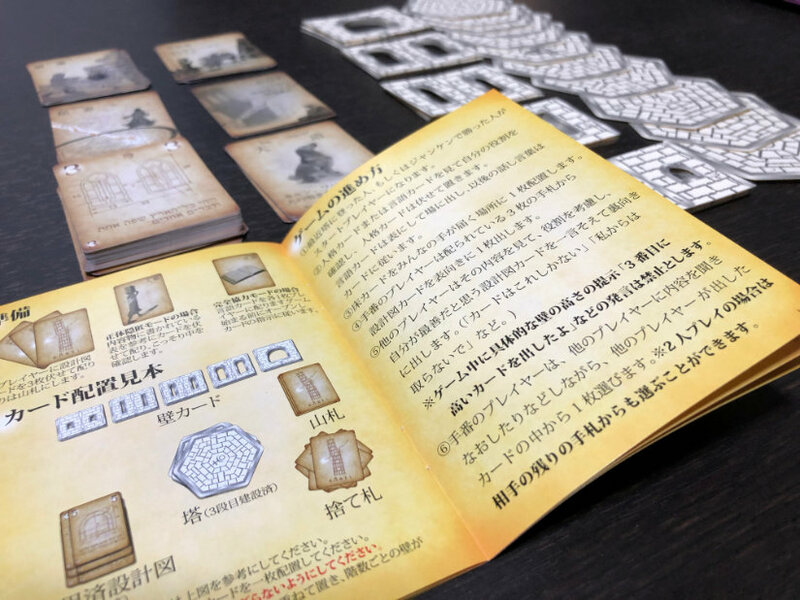 The player can only speak in the language specified on the card. Languages are: frog, lips (but no voice), dog, cat, and robot. This mode can be played by one or more players, and is completely random. Players take turns drawing two Blueprint cards from the deck and use the randomly determined wall heights instead of player-selected cards. 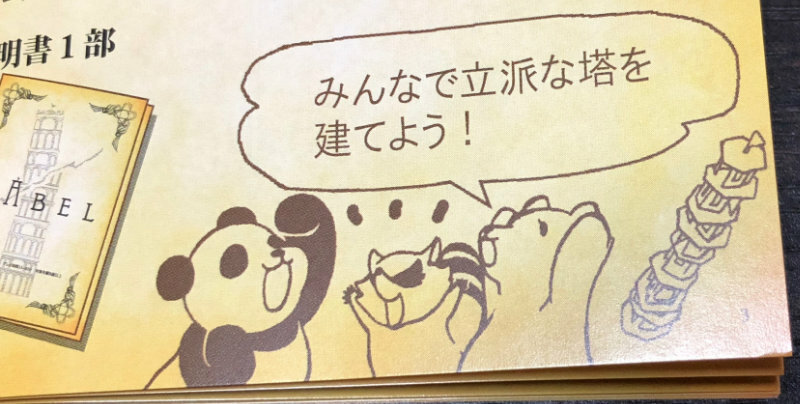 It was a nice surprise to find that the manual contains a comic by Ayame Gonta explaining the rules. I’ve actually had the pleasure of gaming with her, and her story is quite an interesting one. She aspired to be a manga illustrator, but hadn’t seriously pursued it. After having a stroke at the age of 33, though, she quit her day job and became a full time manga artist. She documented her story in the manga If I’m going to die, I’ll die drawing どうせ死ぬなら描いて死ぬ。. The rules are relatively easy to understand and the manga helps explain them quickly. 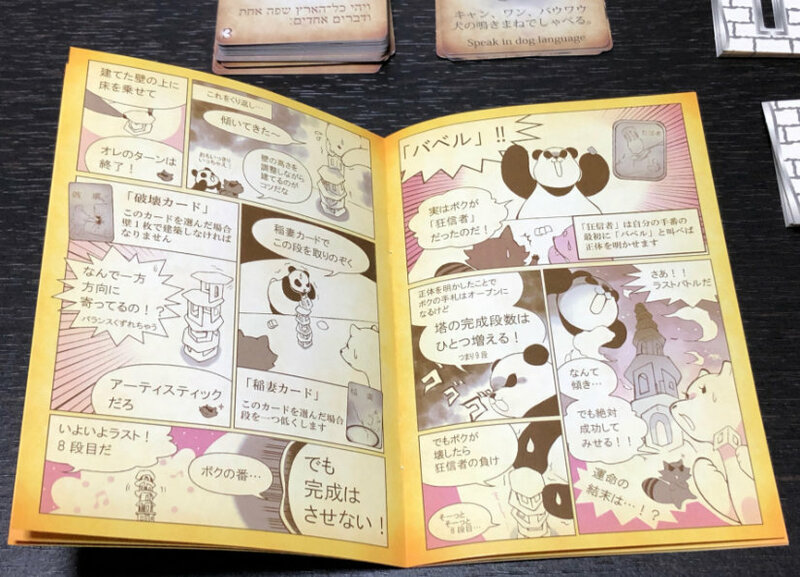 Most of the manual is dedicated to the core Hidden Identity rules, with the other modes being explained in relation to it, so it’s sometimes not entirely clear which rules apply to the other two modes. 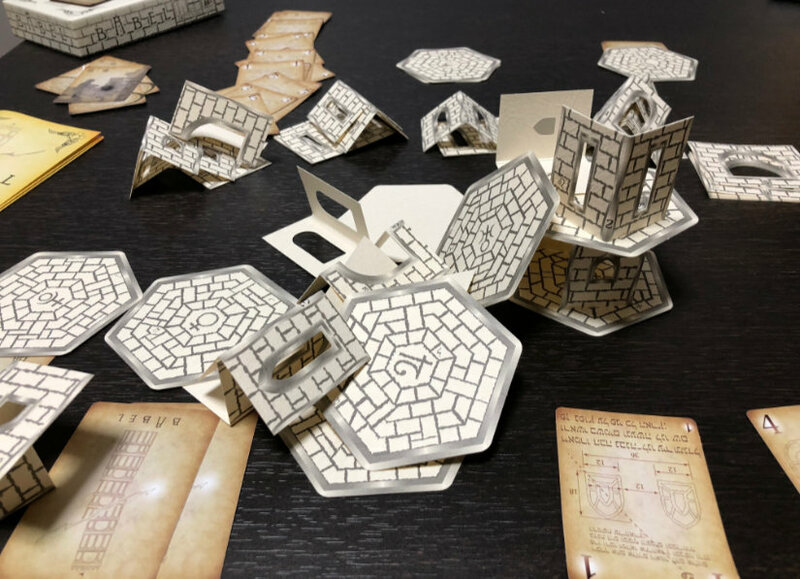 When a player draws a Destruction card from another player or plays one themselves, they build a floor of the tower with a single wall whose height corresponds to the non-Destruction card in the pair. We had fun playing Babel a number of times, but both agreed it’s probably best with three or more players or played in Capricious God mode. Let’s build a splendid tower together!